There’s something so comforting about an oatmeal cookie. 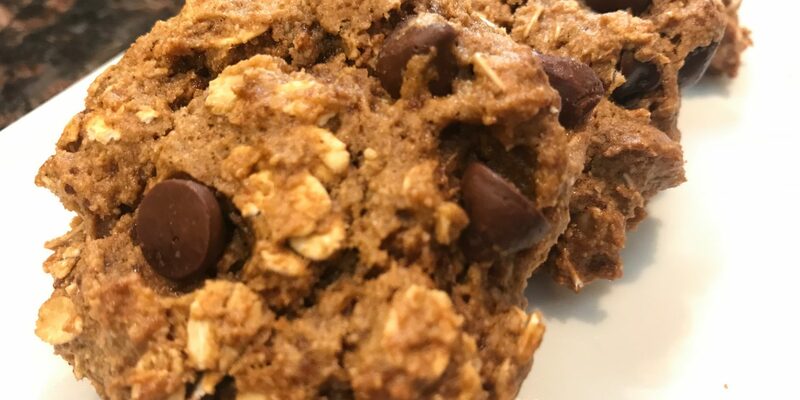 Soft, chewy, these Chocolate Peanut Butter Oatmeal Cookies feel and taste like Grandmom’s kitchen. 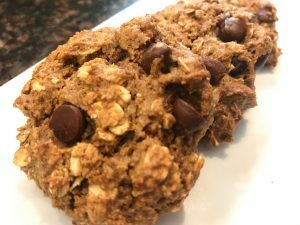 One of his total faves, my husband calls these breakfast cookies, and are a staple in our house. Packed with oats, nut butter, nuts, and applesauce, I’m ok with that a couple days a week. There are certainly worse options out there! Unfortunately, no. Unless the package of oats specifically says, “gluten-free” or “certified gluten-free,” you cannot assume that they are. Even though oats themselves are gluten-free, they can easily be cross-contaminated with gluten at any point during the growing, harvesting, or packaging process. For this reason, we cannot assume that oats are gluten-free, unless the packaging states it. I typically buy Bob’s Gluten-free Rolled Oats at Whole Foods. You can find them online as well. 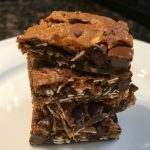 If you aren’t a peanut butter fan, or don’t eat it for health reasons, you can easily swap almond butter, cashew butter, or sunflower butter in this recipe. I love cashew butter for the natural sweetness it adds to the cookies. I tend to use creamy nut butters, but crunchy would add an interesting texture if you like that in your cookies! It’s really important not to overbake these little beauties, especially if you opt to use the AP Gluten-free flour blend for the almond flour. Mine bake in about 10 minutes. Of course, the size of your cookies will influence baking time, so I tend to go off look and feel. They should still jiggle a little, but should not be completely soft. When I push them with my finger, they move slightly, but are not solid enough to push across the tray. If you bake them that long, they will dry out. If you are short on time, or feel like something different, simply, spoon all of the batter into a lined 8×8 baking dish and bake for 20-25 minutes, or until golden brown and baked through. Line a baking sheet with a Silat or parchment. In a stand mixer beat Peanut butter and palm sugar until creamy and blended. Add applesauce and vanilla and beat together for about 30-60 seconds until well incorporated. It will be wet. Add the dry ingredients (except oats and chocolate) on low until just blended. Spoon 2 tsp of batter (I use a scoop) and place on a silpat or parchment lined cookie sheet OR a silicone treated sheet. Slightly press batter down so cookies are not in a ball. Bake at 375 degrees for 10-11 minutes or until light brown. Spoon all of the batter into a lined 8x8 baking dish. Bake for 20-25 minutes, or until golden brown and baked through. 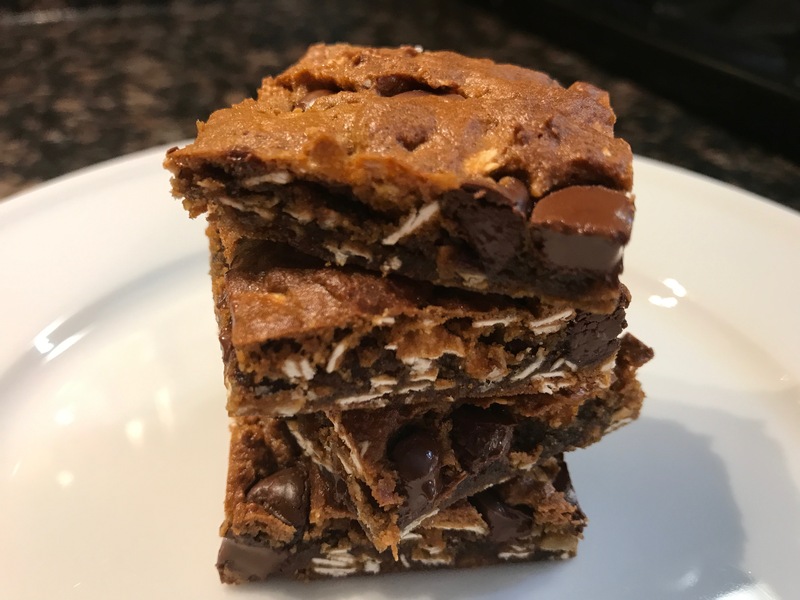 Once cool, cut into breakfast bars.